1. The offer is valid at the time of the sale and up to 7 days after. 2. Please note that differences in charges for the cost of standard shipping will be included in the comparison if applicable. 3. Products must be authentic in brand and size. Products must be of the same manufacturer, same country of manufacture, same country of dispensation, same pack size, same strength, same quantity, etc. (e.g. We will price match a 3 pack of Canadian Brand Name Frontline Plus Green Cat made by Merial to a 3 pack of Canadian Brand Name Frontline Plus Green Cat made by Merial). 4. Products must be in stock at the time of placing an order with the other company. 5. Products must be new as we cannot match the price of any used or expired product. 6. We will only match the current advertised price. 7. Price match can only be issued over the phone with our customer service team. 8. 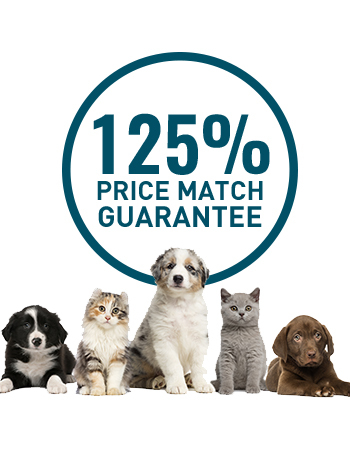 TotalPetSupply will match the price of any products dispensed by a recognized, licensed pet store and is offering an identical product (same Drug Name, same Manufacturer, same Country of Origin, same Strength) that is in-stock and available for immediate delivery. Price matching will be based on an identical quantity being purchased (as compared to the product being price matched), and after factoring in all dispensing fees including shipping.